James L. Coble was born October 14, 1930. He graduated from Mansfield High School in 1948. He enrolled in North Texas State University in Denton on a football scholarship. 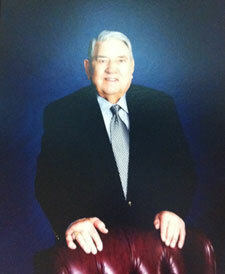 His father, Ivan L. Coble, served on the Mansfield ISD Board of Trustees for about 14 years. In February of 1949 Mr. Coble transferred to Tarlton State University in Stephenville, playing football for two years. His picture hangs in the Hall of Fame there. Mr. Coble transferred to East Texas State University in Commerce in January of 1951, where he also is in the Hall of Fame. While there in 1951 and 1952 playing football he was also a member of the Air Force ROTC and earned the commission of 2nd Lieutenant. Mr. Coble began teaching and coaching football at Stratford , Texas , in 1953. He taught there one year before being called to active duty in the U.S. Air Force where he served as supply officer while playing football. He was discharged in 1956, taught and coached football in Daingerfield , Texas , for the next year. Mr. Coble taught and coached football in Gladewater from 1957 – 1959. In 1959 he retired from teaching to enter the insurance business. In the fall of 1961, Willie Pigg, MISD School Superintendent, hired Mr. Coble as a History teacher and Junior High girl’s basketball coach. In 1963, he was promoted to principal of the Junior High School, and served for 17 years before retiring in 1981.